Although carrots are shipped around the country from California throughout the year, locally grown carrots are in season in the summer and fall when they are the freshest and most flavorful. As you may have suspected, carrot has the highest beta carotene content of all veg. So they are good for your eyesight and many other things. Carrots are an excellent source of antioxidant compounds, and the richest vegetable source of the pro-vitamin A carotenes. Carrots’ antioxidant compounds help protect against cardiovascular disease and cancer and also promote good vision, especially night vision. 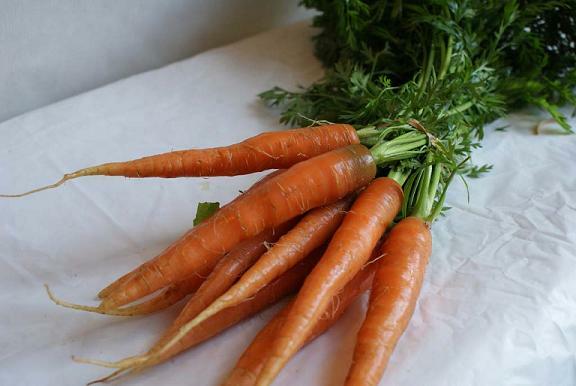 Carrots are a member of the parsley family. Relatives to the carrots are celery, parsnip, fennel, dill and coriander. 1 cup of chopped carrots is just 52 calories and a fiber bonanza with a solid 4 grams. it also contains 6 grams of sugar and 1 gram of protein. Vitamin wise, this cup of carrots has 428% of the daily reccomended intake of A! A powerhouse offering 13% of your vitamin C intake and a good source of folate, B6, and magnese. Remove green tops, rinse, drain, & store in plastic bags in coldest part of the fridge. Add a bit of water in the bottom of the bag; Store away from apples & pears.